Spray 3-quart nonstick saucepan with cooking spray. Heat wine to boiling in saucepan over medium-high heat. Cook onion and garlic in wine 3 to 4 minutes, stirring frequently, until onion is tender. Stir in rice. Cook 1 minute, stirring constantly. Stir in sweet potato and 1/2 cup of the broth. Cook, stirring constantly, until liquid is completely absorbed. Stir in an additional 1/2 cup broth. Continue cooking about 20 minutes, stirring constantly and adding broth 1/2 cup at a time after previous additions have been absorbed, until rice is creamy and just tender; remove from heat. It's a good thing to be short and plump--especially if you're a grain of Arborio rice! 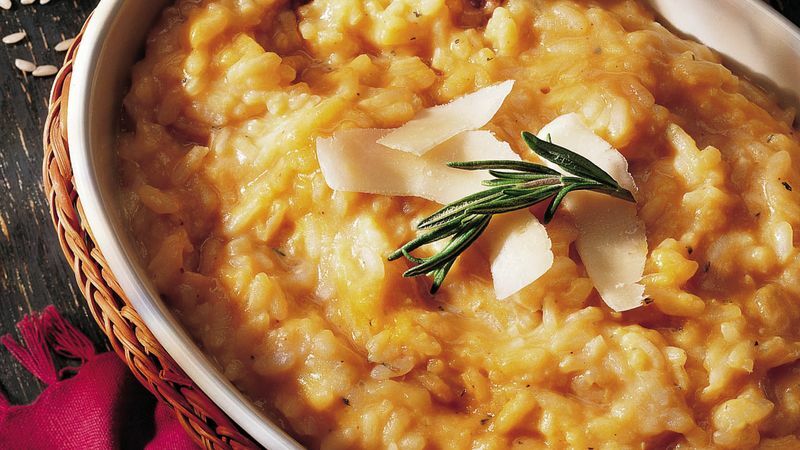 Known for its high starch content, this rice gives risotto its creamy texture. Just add your favorite fruit and a loaf of French bread to make your meal complete.